Lift height over 14 in. Low profile clearance of 4-1/2 in. 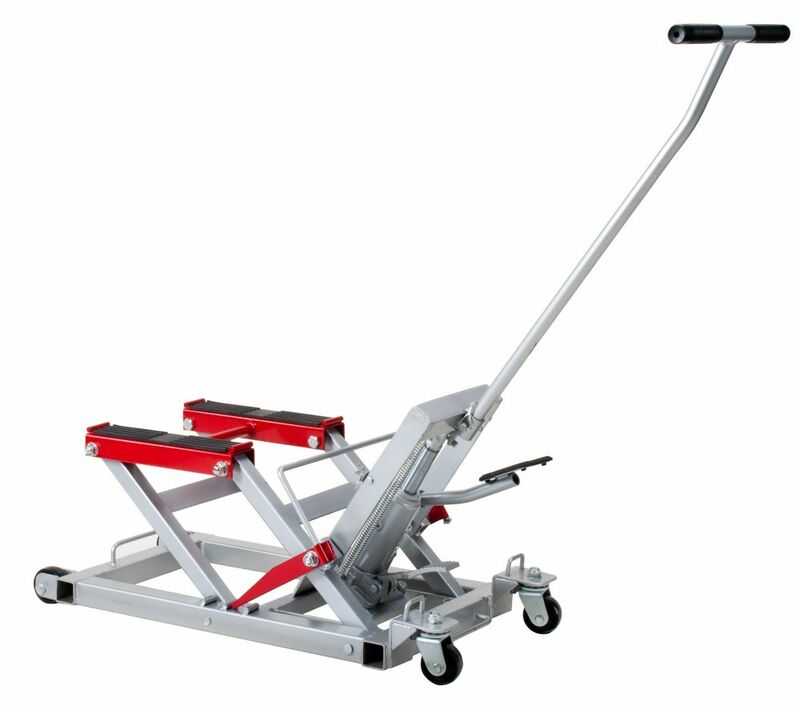 1500 lbs Motorcycle/ATV Lift is rated 4.9 out of 5 by 9. Rated 5 out of 5 by Mike from Worth it’s money. I bought this primarily for my ATV but also found it great for servicing my Zero turn mower. No more taking the deck off to clean it, just jack it up clean the grass off and your done. It also is small and easy to store. Rated 5 out of 5 by Dan64 from Great Working great easy to manipulate very reliable. Happy with product. Rated 5 out of 5 by Denis from Work perfectly Just make sure to support the front or the rear if you take a lot of parts from one end or the other. The bike might want to tip forward or backward. Rated 4 out of 5 by RockMonster from Modifications Required The lift itself is a great product. I would recommend to measure the width of your frame prior to purchase as my bike (2014 Kawasaki 1700 Nomad) was to wide for the bars and required welding extensions on all 4 ends. Other than that this product is great. Rated 5 out of 5 by Mkn1200 from Great product! Great product for storing and working on motorcycle. Strongly recommended. What is the width between the lifting pads? Does anyone know if this would pick up a Can Am Spyder ST? Thank you.